Now we start with four copies of the same triangle. Three of these have been rotated 90o, 180o, and 270o, respectively. 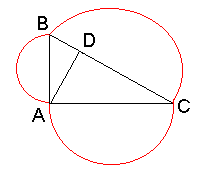 Each has area ab/2. Let's put them together without additional rotations so that they form a square with side c.
simplifying which we get the needed identity. 2c2 = 2a2 + 2b2. 《周髀算经》 dated somewhere between 300 BC and 200 AD and which Loomis refers to as proof 253. This proof, discovered by President J.A. Garfield in 1876 [Pappas], is a variation on the previous one. But this time we draw no squares at all. 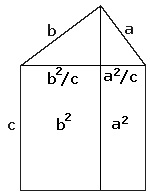 The key now is the formula for the area of a trapezoid - half sum of the bases times the altitude - (a + b)/2•(a + b). 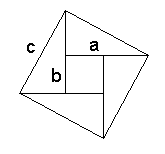 Looking at the picture another way, this also can be computed as the sum of areas of the three triangles - ab/2 + ab/2 + c•c/2. As before, simplifications yield a2 + b2 = c2. Two copies of the same trapezoid can be combined in two ways by attaching them along the slanted side of the trapezoid. One leads to the proof #4, the other to proof #52. AB•AB + AC•AC	= BD•BC + DC•BC = (BD+DC)•BC = BC•BC. In a little different form, this proof appeared in the Mathematics Magazine, 33 (March, 1950), p. 210, in the Mathematical Quickies section, see Mathematical Quickies, by C. W. Trigg. which perhaps more transparently leads to the same identity. 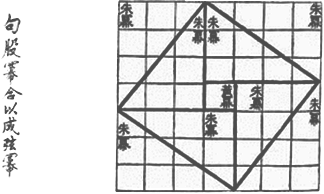 In a private correspondence, Dr. France Dacar, Ljubljana, Slovenia, has suggested that the diagram on the right may serve two purposes. First, it gives an additional graphical representation to the present proof #6. In addition, it highlights the relation of the latter to proof #1. It must be mentioned that this proof is just a variant of the next one - Euclid's second and less known proof of the Pythagorean proposition.